Yesterday was the first day for our San Diego Quilt Run. There were 16 shops involved and it runs from March 6-13th. Not certain if I will make it to all the shops, but I am sure going to try. I met up with my quilting buddies at Memory Lane Quilt Shop in Santee. Then we were off to Rosies, one of San Diego's largest Quilt Shops and a must see if you are ever in the area. We also hit The Country Loft and Cozy's. Also worked on the blocks for Sunshine Quilt Guild. We have a block each month that we make and then a winner is drawn and they get to take all the blocks home. This month it is a block called Bullseye. The winner cuts the blocks into quarters and sews them back together. It should be a fun quilt when it is all finished. My Blocks are below. Have a great week and ﻿don't forget toCheck out more Stash Reports at Patchwork Times. Good morning to you. I am sure that you had a great time on the quilting run. You were really good purchasing only one yard of fabric. Congrads to you. 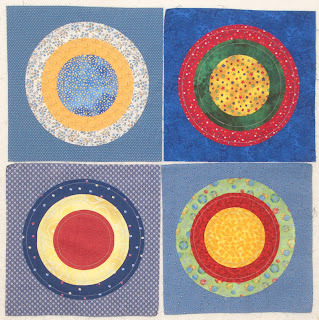 I love the bulleyes, can't wait until I see the finished quilt. Wow - you went to all those shops and only bought 1 yard of fabric - I am impressed!! I definitely couldn't go to several shops and only purchase 1 yard, great going. Three quilt shops and only a yard of fabric purchased....very impressive! I bet you had a great time visiting all the shops with your friends!